All transactions are safe and secure with a reliable history in online purchasing behind each of our associates. 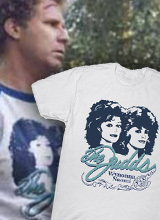 Buy The Judds t-shirt to own Step Brothers clothing and merchandise. This Step Brothers tee is the Judds shirt Will Ferrell wore. Here, the design depicts the women with the phrase, "The Judds". As Brennan showed us in the Step Brothers movie, it is great to wear when you are burying your brother or rolling around in the dirt during a fight. This graphic is available in a variety of colors and styles sure to crack fans up. For other tees that will definitely make your friends and family laugh, remember to check out the Boats N Hoes t-shirt, the Prestige Worldwide tee and the Chuck Taylor Step Brothers Converse shirt available above. In addition to The Judds tee above, browse the Step Brothers Clothing Gallery for more apparel like men's and women's clothes, kids shirts or hoodies.